Boyd had an open tibia fracture that became infected and required a flap. This healed with a large deformity causing him difficulty walking and pain. 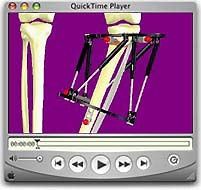 An percutaneous osteotomy was done and an Ilizarov/ Taylor Spatial frame was used for gradual correction of the deformity. At 4 months, he is all healed and pain-free because his alignment is corrected. and progression of arthritis is slowed.